Nathan Carpenter, the School of Communication's assistant director for convergent media, inside the new Social Media Analytics Command Center. Forget hashtags, tweets, or snaps. The buzzword that really matters in social media is analytics. That’s one of the reasons Illinois State’s School of Communication just opened the doors on its new Social Media Analytics Command Center (SMACC) in Fell Hall. 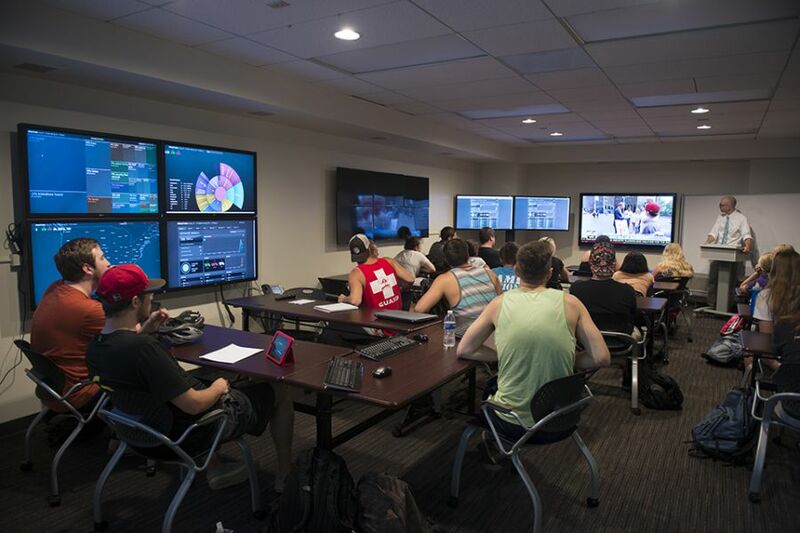 The 600-square-foot space features a video wall and is lined with touch screens where students can interact with visualized social media data. SMACC—pronounced “smack”—catapults the School of Communication onto the cutting edge of new media, and will give students a leg-up as they apply for internships and full-time jobs. Using Facebook for fun is just the tip of the social media iceberg, said Nathan Carpenter, the school’s assistant director for convergent media. SMACC is in 275 Fell Hall, a renovated speech lab that now fits up to 25 students. The center is powered by Nuvi, a real-time analytics platform focused on social media listening, engagement, and reporting. Users can track keywords, hashtags, and topics, and then see data visualizations. One of the classes using SMACC is Carpenter’s Social Dynamics of Communication Technologies. Five School of Communication courses plan to use SMACC this semester, along with independent student and faculty researchers. One of the classes is Carpenter’s Social Dynamics of Communication Technologies, which looks at how new technology impacts social institutions and social change. One of his students is Patrick Barrins, a senior mass media management major who spent last summer with Carpenter helping physically put together SMACC. The Morris native says students across campus—not just communication majors—can benefit from this new window into social media. Barrins, who is WZND’s assistant program director, wants to pursue a career in radio. “If I can get a grasp of Nuvi, a lot of businesses or radio stations can benefit from someone who knows how to track social media and can help them reach more people. That’s very valuable,” he said. It’s extremely rare for a university to have a social media command center like SMACC, said Steve Hunt, a professor and associate director of the School of Communication who helped launch SMACC. Inspired in part by a similar center run by an Illinois State alum at Clemson University, Hunt and Carpenter saw SMACC as a big step toward addressing a phenomenon facing communications professionals everywhere—media convergence. SMACC was a good fit because social media impacts four core programs in the school: journalism, mass media, public relations, and communication studies. Students are already using SMACC to explore how local health communicators send messages to the public, and how public relations professionals interact with their communities during crises. It also complements the School of Communication’s other high-profile program offerings, such as The Vidette and WZND; TV-10 is already taping a new show about social media inside SMACC.